Several species of wasp and true fly lay their eggs on or inside ladybird larvae, pupae or adults. When the eggs hatch, the larvae of these parasitoids feed inside their ladybird host, exiting when fully-fed to pupate and emerge as adults outside the ladybird, which dies as a result. These parasitoids include the wasp Dinocampus coccinellae (Braconidae) – see picture, at least one species of scuttle-fly (Phoridae), and a tachinid fly. Other notes: Very variable in pattern. The ladybird that most commonly overwinters in buildings. Other notes: Extremely variable in colour and pattern. When I iRecorded this Pine Ladybird it was classed as out of area so its the first recorded sighting of it in St Davids. Other notes: Round in shape with a pronounced rim around the margin of the wing cases. The spots at the outer front margin of the wing cases are comma-shaped. The Orange Ladybird is a large ladybird that feeds on mildew (fungus) on trees, particularly Sycamores, but has recently spread on to Ash and is increasing in numbers. It hibernates in leaf litter or in sheltered locations. The lifecycle of a ladybird consists of four phases: the egg; the larval stage, during which the larva undergoes a series of moults; the pupa in which the larva develops into an adult; and the adult phase, during which the female lays egg in batches of up to 40. The Orange Ladybird is pale orange with 14 to 16 white spots. 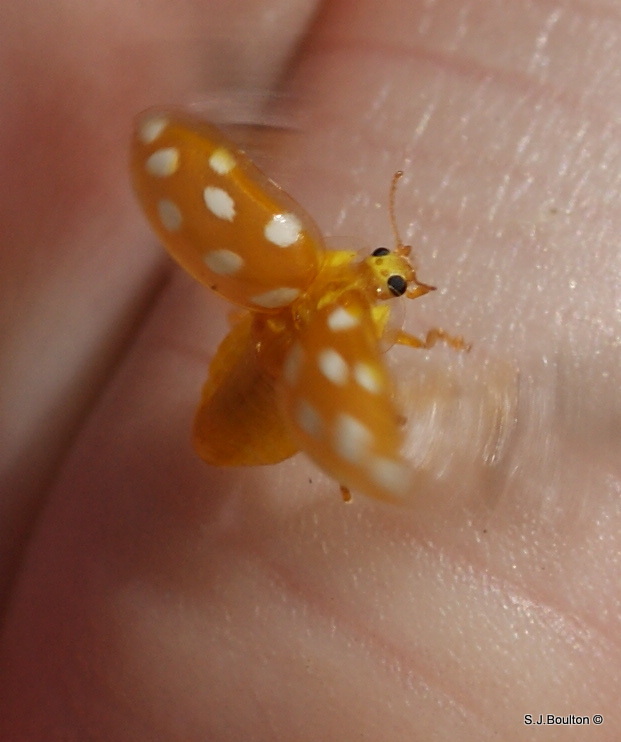 The Cream-spot Ladybird is similar, but is a darker browny-orange colour and is a little bit smaller. Cream-spot Ladybirds are more often found on bushes and at woodland edges. Widespread in England and Wales, less common in Scotland. Length: 4 – 5mm. Background colour: red. Pattern colour: black spots. Number of spots: 7-11 (11). Spot fusions: uncommon. Melanic (black) forms: no. Pronotum: black with anterior-lateral white marks; broadest at base. Leg colour: black. Other features: black spots occasionally surrounded by a thin yellow ring. Fourth-instar larva: closely resembles 7-spot ladybird, but smaller and without the conspicuous orange lateral patches on first thoracic segment; abdomen has orange spots in pairs on a grey-black background. Pupa: black front section but otherwise cream with inner tubercles on abdominal segments forming two dark bands running longitudinally; orange lateral patches on first abdominal segment; inner and outer tubercles on fourth abdominal segment also orange. Habitats: The 11-spot ladybird is an elusive species that occupies a variety of habitats but particularly dune systems. The coastal nature of this species is further highlighted by the number of strandline records. 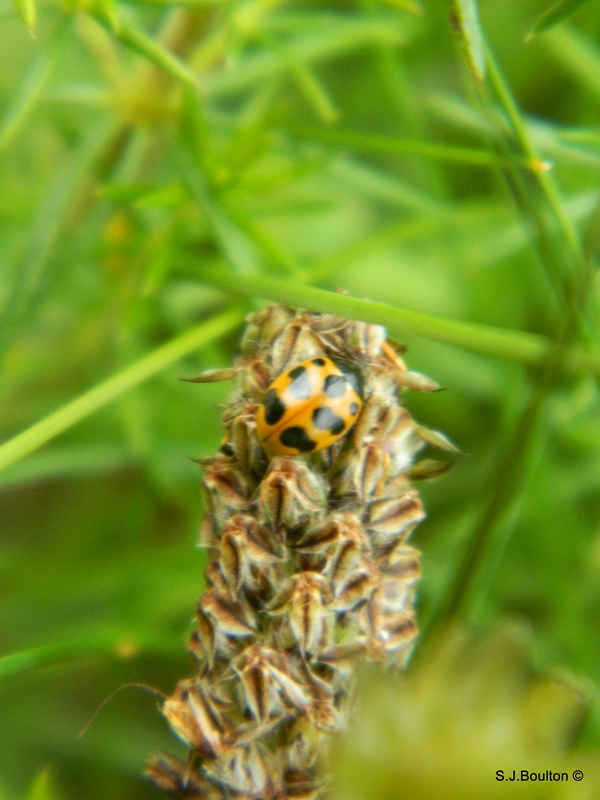 Host plants: 11-spot ladybirds are commonly associated with sea radish, nettle, gorse, rosebay willowherb and thistles. There are a scattering of records from deciduous trees including ash, beech, sycamore and oak. 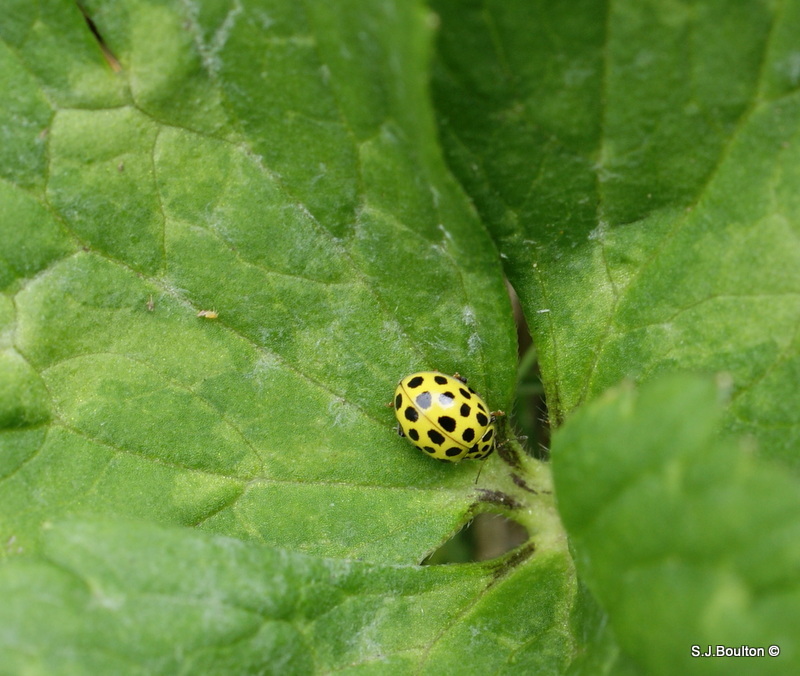 The brightest of the yellow British ladybirds, it always has 22 spots, which rarely join up. It is a very small ladybird at 3 to 4.5 mm. There are two colour varieties, one where the pronotum is yellow, the other where it is white. As a mildew feeder, the 22-spot Ladybird is best looked for amongst low vegetation. It is unusual amongst ladybirds in that eats mildew, grazing from the soil surface or from low herbage. The 22 spot is fairly frequent throughout England, but less so in Scotland and Wales.